Washington Park, one of the oldest sections, was created in 1669 as the 'Upper Commons' or 'Market Place.' Prior to the Revolution, it was the site of the old Newark Academy. Every phase of the city's history is reflected in the park's design and by the buildings which surround it, such as the Ballantine House, the Renaissance-styled office buildings of the 1920s, the art deco-style telephone building on Broad Street, and the more recent office buildings of the 1950s through 1970s. It is the Renaissance-style buildings which concerns us here. Today, a walk around the park draws attention to the recently restored Veterans Administration building, which is emerging as one of Newark's most successfully adaptive rehabilitated structures.A complete list of classical buildings includes the Newark Public Library, completed in 1901; the Veterans Administration building, built as the Globe Indemnity Co., 1920; the Newark Museum, 1926; Rutgers Law School, originally the American Insurance Co., 1929, and St. Philip's Academy, built in 1932 as the Eagle Insurance Co. The traditional style in which these buildings were designed was based upon motifs from Greece and Rome, interpreted in the Renaissance Italian manner. Columns in the Ionic, Doric and Corinthian orders are merged with pilasters, quoins, barrel arches, vaulted ceilings, decorative metal grill work, and rustication set out in textbook style and form. 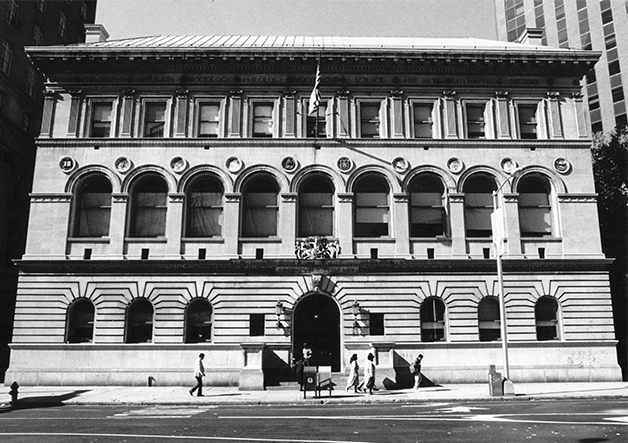 The first of the Renaissance temples was the Newark Public Library, begun in the last century and completed in 1901. It was inspired by a general design for the Boston Public Library. Next on this impressive list was the Veterans Administration building, followed by the Newark Museum, a building of less decorative quality, but clearly antique and stunning in design. The American Insurance Co., now Rutgers Law School, applied the Renaissance style to a 1920's skyscraper, and St. Philip's Academy, although smaller in size, was no less attractive in the Greco-Roman-Renaissance tradition. Newark has already emerged as the nation's second largest insurance center, thanks to Mutual Benefit, established in 1845, and the Prudential Insurance Co., founded in 1873. At this time, the Globe Insurance Co. of Liverpool England moved its subsidiary, the Globe Indemnity Co., to Newark from New York City and built the tower now used by the Veterans Administration. Architects Frank Goodwillie and Wesley S. Bessell designed it. Note the similarity of this building and the library building, completed two decades before. Both are examples of Italian Renaissance architecture adapted to 20th century use. Essentially, each is a rectangular 'classical box,' built on the edge of the park. Each also contains traditional elements of an Italian city palace. Their first floors are designed of rusticated heavy stone work; their middle levels are dominated by nine barrel vaulted bay windows, and each building is capped with a classical roof structure. In the 1990s the crucial decision was made by the Veterans Administration to stay in Newark, according to Brian W. Tait, property manager of the General Services Administration (GSA). This commitment came with a pledge to support the inner city as well as to preserve one of Newark's landmark buildings. Although money and land were available elsewhere, the GSA decided to restore the British-built insurance company building, retaining its status as a major architectural and governmental anchor on WashingtonPark. Robert Van Sprang, regional director of the Department of Veterans Affairs, played a central role in the GSA's decision. The interior restoration design fell to Lindemon, Winckleman, Durpree and Martin. The exterior facade treatment, fenestration and interior ground floor lobby color selection was handled by noted Renaissance restoration architect Giorgio Cavaglieri of New York. The Saxon Construction Co. is implementing the design plans. On your next visit to WashingtonPark, take a look at part of our past being made ready for the future. I think you will like it.